Originally published, Feb. 23, 2007. A thoroughly-footnoted February 12, 2007 article in the online edition of Journal of the Business Law Society at the University of Illinois College of Law stops just short of joining virtual land baroness Ailin Graef (‘Anshe Chung’) and others in calling well-known Second Life savings bank “Ginko Financial” a ponzi scheme. People have been beating this drum since shortly after Ginko’s formation, but a consistently slipping interest rate paired with statements Ginko Financial owner ‘Nicholas Portocarrero’ made in a recent Reuters interview, suggest that the allegations may deserve a fresh look. A ponzi scheme involves enticing new investors with claims of huge returns, and using their money to pay off earlier investors (rather than paying investors part of the profits from a legitimate business enterprise or investment). Whether or not you have money on deposit with Ginko Financial, the University of Illinois College of Law article is worth paying attention to because a crash at Ginko, which now claims over L$118m (about US$475,000) in deposits, would likely generate multiple lawsuits targeting both the owners of Ginko Financial and Second Life creator Linden Lab itself. It would also significantly ratchet up pressure for regulatory scrutiny of in-world financial transactions. Why the concern from the students at the University of Illinois College of Law? To start with, the usual criticisms of Ginko: zero transparency regarding investments, potential underfunding of available withdrawals, and management’s steadfast refusal to remedy either problem. But there’s a new wrinkle — Ginko Financial’s consistently-dropping interest rate was reduced again on February 1, 2007, and is now significantly less than half the rate Ginko was offering just 16 months ago. In addition, Ginko Financial’s owner ‘Nicholas Portocarrero’ recently told Reuters that Ginko keeps only around 5% (and “sometimes less”) of its deposited funds available in-world in $L for immediate withdrawal by depositors, and Ginko provides no specific information about where or how the remaining 95% of the funds are held or invested. VB sought comment from ‘Portocarrero’ in-world and via a form on the Ginko Financial website for this article (no other contact information is available). ‘Portocarrero’ declined, saying he is “not currently available for interviews.” ‘Portocarrero’ has not revealed his real identity. On February 1, 2007 Ginko decreased the daily interest rate paid on depositors’ funds 10% (from 0.10% to 0.09% daily). This was not the first rate-drop. 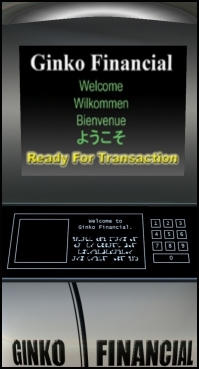 In fact, the Second Life Herald reported that Ginko’s daily interest rate was as high as 0.19% as recently as October, 2005. The former 0.19% daily interest rate represents a 100% annualized return. The new 0.09% rate equals roughly a 39% annual rate of return — that’s a 61% drop in less than 16 months. You can run the numbers yourself here. It isn’t easy finding historical interest rates for Ginko Financial. Historical rate data is not available on the Ginko website, posts announcing rate changes quickly scroll off the main screen and are gone forever from public availability, and Ginko’s pages have all been excluded from the internet archive. From the limited information available in archived Second Life Herald articles and various forum posts, however, it appears that the rate started at 0.19% daily (a perfect 100% annualized rate of return), and has been steadily dropping ever since, to its current .09% daily return. To put this in perspective, the claimed annualized rate (around 39% after the last drop) is still more than ten times the rate paid by mainstream brick and mortar banks on savings accounts. But the fact that the rate has dropped over 60% in less than sixteen months should raise new red flags for potential depositors, especially given the complete opacity of Ginko Financial’s management, investments, and history. Second Life’s recent growth explosion compounds the problem. New users who are considering depositing Lindens with Ginko have no way of knowing that Ginko’s rate has been dropping steadily since its creation. There are other new red flags too. 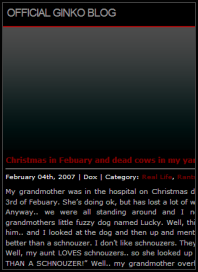 The “official Ginko blog” is run by someone who refers to himself as ‘Hinoserm,’ and who identifies ‘Nicholas’ ['Portocarrero'] as “GFinancial’s owner and my boss.” Bluntly, the blog makes it look like the whole thing is run by a handful of kids who are in over their heads, not an evil financial genius. You get a somewhat different picture by visiting Ginko’s island complex. Here’s a SLURL, if you’re curious. 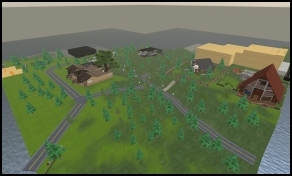 Visitors to the complex will currently find well-lit, tree-lined roads and bridges connecting spacious wooded estates, condominium complexes, and offices. Though much of the land is protected by access lists, quite a bit is explorable. The art on the walls in homes and offices on the island indicates that the complex is largely populated by furries. A sign in the office says that some of the land is for rent, and new construction is evident. There are three connected island sims in the complex. For readers who are trying to determine whether this is, (a) a scam, (b) a half-baked idea that has gotten out of control, or (c) a great opportunity that Goldman Sachs just hasn’t tumbled to yet, it is worth keeping in mind that it is not inconsistent with a ponzi scheme for some people to make money. Mitchell Zuckoff, author of “Ponzi’s Scheme: the True Story of a Financial Legend,” says that ponzi schemes are sometimes profitable for early investors. And with the new user churn rate for Second Life as high as it is, the bleed could be even slower for an in-world scheme, especially since some deposits are certainly abandoned to Ginko when users leave Second Life. [W]e cannot guarantee that we will always have enough to pay people quickly, though we will endeavour to do so. Also, there is inherent business risk involved in this venture. These accounts not being insured in any way by any government, like in the case of most real life savings accounts, we cannot guarantee that we will never go bankrupt. Because there is absolutely no transparency regarding Ginko Financial’s investments, it is impossible for depositors to know if the dramatic and relatively rapid rate-drop indicates decreases in the value of the investments that Ginko is supposedly making, or the inevitable death spiral of a failing ponzi scheme. Virtually Blind hopes that this does not end poorly — not only for Ginko’s depositors and management, but also for the future of a relatively unregulated in-world economies. That said, VB must add its voice to the concerned chorus. There is a huge potential problem here with wide-ranging legal and political implications. The sky is not falling, at least for the moment. Abandoned deposits are likely providing some actual revenue to Ginko, and if Ginko’s numbers are to be trusted, Second Life users continue to make significant deposits. In the total absence of disclosure regarding the location and use of the deposited funds, however, the rapidly falling interest rate and recent statements ‘Portocarrero’ has made in the press lead VB to conclude although it cannot be proven at this point, there is no reason to believe that Ginko Financial is currently anything other than a ponzi scheme, whether that was the original plan or not. There is an extent to which people are getting what they ought expect from such a scheme: a very high-risk, high-return investment. The difficulty is that it seems that Ginko goes out of its way to hide information that people ought to be able to use to make decisions about whether to invest: that, as distinct from merely not telling people where the money is going, is probably a sufficient reason in and of itself to stay away from Ginko, as deliberately hiding information creates a strong impression of dishonesty. As to legal and political implications, I should suggest that problems with in-world investments suggests the need sophisticated in-world governmental systems capable of passing in-world laws, enforced in in-world courts, dealing with in-world financial services regulation. I agree wholeheartedly with you Ashcroft. You know, gentlemen, that we should really think about banding together to do this “right”. I’m not sure if the above comment comes from someone affiliated with Ginko or not, but if it does, please consider getting in touch directly. I’d be happy to talk to you about Ginko if you are willing to provide more information. Answering the concerns of skeptics like me would go a long way toward legitimizing Ginko, but so far, Ginko has categorically refused to talk about its business model, leaving me and many others basically no choice but to conclude that Ginko is hiding something.